With the disruptions these technologies dictate, businesses need information systems professionals who can define an IT system’s architecture to support the company’s strategy. Someone who can dive deep into technical issues and produce objectives that are aligned with business goals and process. Which is exactly what the Enterprise Architect does. The core output of an Enterprise Architect is to create a complete design of the enterprise. If you love technology, are highly analytical and a leader, this position could deliver a satisfying professional prospect for you. Your decision to upskill in the systems and technology industry and move towards the role of Enterprise Architect has never looked so simple. Find out which daily responsibilities, skills and knowledge you need to influence your earning potential as an Enterprise Architect. 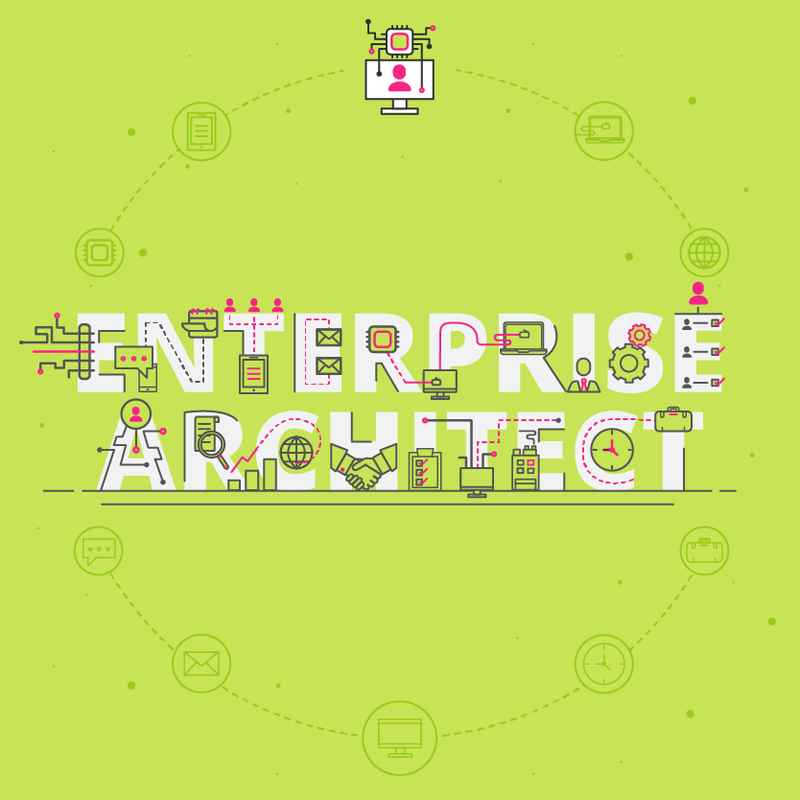 What are the key responsibilities of an Enterprise Architect? The role is dynamic and multifaceted – it’s not just about having tech skills but also business process knowledge. Within the Enterprise Architecture team, your role could be anything from a Lead Enterprise Architect to a Solution Architect, to a Security Architect – all of which have different responsibilities. The demand for Enterprise Architects will continue to grow as the economy becomes increasingly tech-focused – are you ready to grab hold of the opportunity? If you’re interested in climbing the corporate ladder and moving into the executive suite of the business, working as an Enterprise Architect is a good career move. Chief Architect Examines how IT functions can be centralised so that all departments can work together seamlessly. Chief Technology Officer Executive-level position focused on scientific and technological issues within an organisation. Chief Executive Officer The highest-ranking executive in a company, responsible for making overarching corporate decisions, managing the overall operations and resources of a company, and acting as the key point of communication between the board of directors and corporate operations. What is the potential salary for an Enterprise Architect? What are the education and training requirements for an Enterprise Architect? If you’re an aspiring Enterprise Architect, it’s important to have a clear roadmap in order to make it in this demanding and competitive industry. Step 1: Study a Bachelor’s degree in one of the component architecture disciplines first: business architecture, data architecture, application architecture, network architecture, security architecture. Step 2: Learn an EA framework that allows you to work with other architecture disciplines, and get certified as an EA. The Open Group Architecture Framework, TOGAF has certified almost 45,000 people and is widely recognised as the best EA certification to hold but you can also go through the FEAC Institute for certification. Step 3: Become an apprentice and work under an experience Architect or two of the first few years of your career. Step 4: Study a Master’s Degree in Enterprise Architecture. Step 5: Keep your IT knowledge and practical skills relevant with an online short course in Business Process Design for Strategic Management, Business Systems Analysis or IT Management, or Information Systems Management. Download a course prospectus to find out how one of these online short courses can help you become an Enterprise Architect.